Fire is an unpredictable disaster that can be overwhelming. Residential fire and smoke damage happens quickly and without warning. Within minutes fire and smoke can devastate your property and disrupt the life of you and your family. 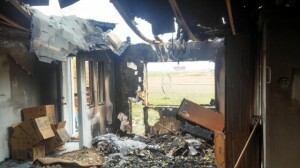 When fire damage strikes your home you need fire restoration professionals that you can trust. The certified and professional technicians at Ally1 Disaster Solutions respond 24 hours a day, 7 days a week when your home is in need of fire & smoke damage cleanup. You never have to handle the emotional stress of a home fire on your own. Ally1 Disaster Solutions will help help you navigate the process with experience and compassion. A home fire may destroy personal possessions, but we will help repair the loss and work to salvage precious photos, heirlooms, and belongings. When it comes to fire & smoke damage cleanup it is important to quickly reduce soot, smoke, and take action to prevent other long term damage and risks in general. Fire and smoke damage cleanup involves many components. There is more to expert fire cleanup than simply slapping on a new coat of paint. It is not uncommon with fire damage to find serious damage to the structure of the house, as well as buildup of char, dust, and other contaminates that can be detrimental to the health and wellness of any future occupants. Why Choose Ally1 Disaster Solutions for Fire Damage in Hurricane UT? When your home suffers fire or smoke damage you can trust the 20 plus years of experience that Ally1 Disaster Solutions brings to every job. We are I.I.C.R.C. certified, fully licensed and insured, we treat your home and belongings like our own, and respond immediately. Our people are the best fire and smoke technicians in Cedar City, Beaver, Richfield and Hurricane, and you can trust us to help you successfully overcome your residential fire & smoke cleanup emergency. Trust Ally1 Disaster Solutions to help you restore your home and get life back to normal.